The 2010 Phoenix Open will draw hundreds of thousands of people to Phoenix and Scottsdale shops and restaurants. Just blocks from the Open, is the new Scottsdale Quarter – a new city district, right across the street from Kierland Commons (great shops and restaurants). The stores are starting to open at the Scottsdale Quarter. The new Apple Mac store is beautiful and the Oakville Grocery was packed with customers enjoying high quality gourmet, specialty food and wine. 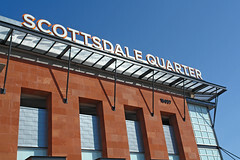 For information on these Scottsdale shopping areas, visit ScottsdaleVacation.com. For information on some of our favorite restaurants while you visit Phoenix-Scottsdale, visit PhoenixMenus.com and ScottsdaleMenus.com. 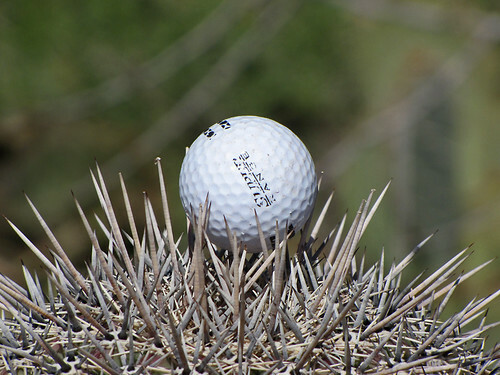 The Waste Management PHOENIX OPEN Golf Tournament comes to town this next week. 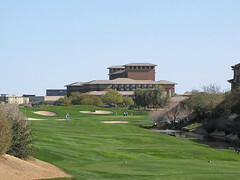 The tournament is held at the Scottsdale TPC, which is basically kitty-corner to the Kierland Golf Course, pictured here. The Westin Kierland Resort and Spa is a great place to stay when visiting Scottsdale. Close to great golf and great shopping. We were just up there over the weekend and the weather was spectacular, and the stores and Scottsdale restaurants were packed. The Phoenix Open is a great place to watch golf, and even if you have no interest in golf, it is a great place to get exercise walking and people watch. And don’t forget the wild 16th hole, if you go. 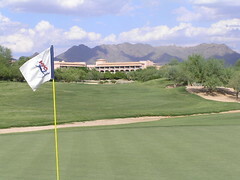 For info on resorts, shopping, golf and more in Scottsdale – visit ScottsdaleVacation.com.